These five stories range from humorous to inspiring, slightly cheesy to perfectly believable, romantic to heartbreaking. When Celaena’s scheming master, Arobynn Hamel, dispatches her on missions that take her from remote islands to hostile deserts, she finds herself acting independently of his wishes—and questioning her own allegiance. Along the way, she makes friends and enemies alike, and discovers that she feels far more for Sam than just friendship. But by defying Arobynn’s orders, Celaena risks unimaginable punishment, and with Sam by her side, he is in danger, too. They will have to risk it all if they hope to escape Arobynn’s clutches—and if they fail, they’ll lose not just a chance at freedom, but their lives . 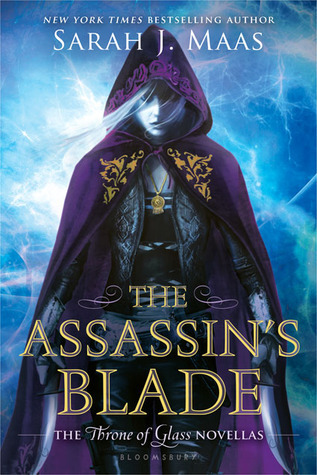 . .
A prequel to Throne of Glass, this collection of five novellas offers readers a deeper look into the history of this cunning assassin and her enthralling—and deadly—world. Though these novellas tell the story of Celaena’s life before the Throne of Glass series begins, I think they should be read at least after you have read the first book, maybe after you read the second. You won’t understand the significance of Celaena’s actions or fall so completely in love with this younger, more innocent version of her character unless you know what she becomes. You also don’t have the mount sense of dread as you near the ending of the novella collection–which ends with the betrayal that lands her in Endovier. The one thing that absolutely blew me away about this book was the depiction of Arobynn. He is creepy as heck, and his emotional hold over Celaena is fascinating. You never fully understand how he feels about his protegee. For me, I’d spent most of Throne of Glass admiring Arobynn. He was her savior/father figure/the guy who made her awesome. In this book, you slowly hate him more and more. I kept wanting him to be a good guy and it never happened. The way his character played with my emotions (as well as Celaena’s) amazed me, and made what could have been a lackluster collection of stories a major part of the series. These novellas lack the fantasy elements that characterize the later books in the series, but give the reader a window into Celaena’s character as the continent’s greatest assassin. I’ll talk about each novella individually, avoiding spoilers. I liked this one. You get to see Celaena’s own morals contradict Arobynn’s orders as well as the beginning of her relationship with Sam. Of course, Celaena is a badass, and you get to see her in the height of her career as Ardlan’s Assassin. It is heartwarming to see how confident and sassy she was before her life fell apart completely. However, as the pivotal event that sets the rest of the novellas (and arguably the entire series) in motion, I think Maas could have come up with a more creative concept. My least favorite by far. It felt cheesy. I like that we get to see a softer side of Celaena, but it could have been done better. This novella feels like a random stop between two important plots–the pirate lord and the red desert. My favorite story!! I wanted this to be an entire book. The Red Desert was so perfect for Celaena: it humbles her and helps her grow. This novella has a clear plot arc and good character development. I was emotionally invested in this novella, 100 times more than the previous two. Also, it highlights just how screwed up her relationship with Arobynn is. This story was emotional trauma for me as a reader. Celaena comes back from the Red Desert so confident, and then you have to watch Arobynn slowly drag Celaena back into his thrall. Her relationship with Sam gets more and more charged, but Celaena is of course, an idiot about it. Overall, it added to the novella collection, but did not impress me as much as the previous story. I love the romance in this one, but I also spent it on edge, knowing how the book ends. This story perfectly gives the reader a window into what led Celaena to Endovier, and helps you understand just how broken she was when Throne of Glass began. In terms of affecting the rest of the series, this one is the most important–a must read.